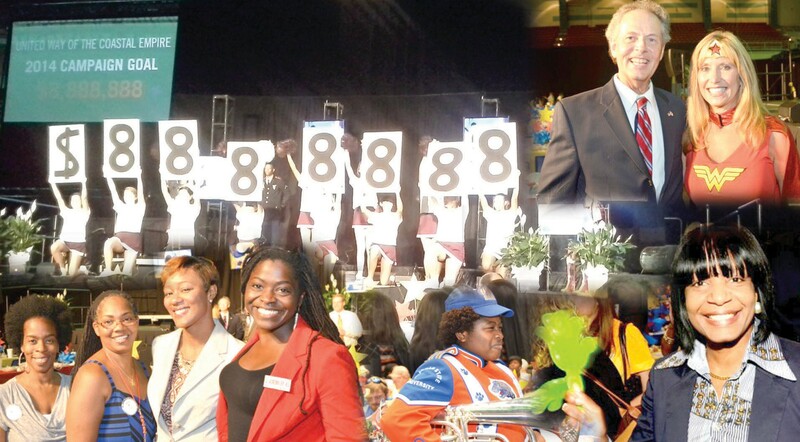 United Way of the Coastal Empire set its 2014 fundraising goal with over 1,200 people in attendance at its kick-off at the Savannah Civic Center. The organization is working towards $8,888,888 in donations to help support human service programs that improve lives of people in Bryan, Chatham, Effingham and Liberty Counties. This year, the campaign is led by Market President Jenny Gentry of Wells Fargo. Together, with her team of volunteers who comprise the Campaign Cabinet and Loaned Associates, Gentry will carry the 2014 campaign message, “Together Working Wonders,” to employee groups, businesses and individuals across the community. During the luncheon, local businesses within the community reported results from their campaigns that were conducted in early August. These “Pacesetters” got a head start on their campaigns in order to set the bar for the community campaign as a whole. This year’s Pacesetters have helped to kick-off the campaign with $702,091 or 7.9 percent of this year’s goal. United Way’s 2014 Campaign will run from September 4th through November 21. 55 individuals can pledge a donation by calling 912.651.7714 or visiting www.uwce.org.